I couldn't resist being drawn to the romance of Tough Old Bird's new album. 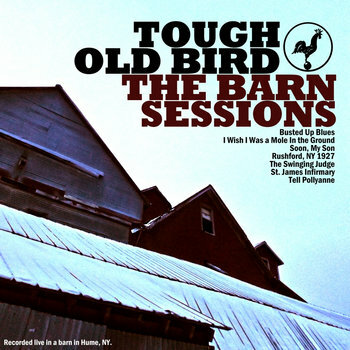 Recorded in a barn in Hume, NY (which is probably not named after the great Enlightenment philosopher, but I'm going to pretend it is because upstate New York, the Enlightenment, barns, and blues are all things I can get behind.) Tough Old Bird, comprised of brothers Matt Corrigan and Nathan Corrigan, present four originals and two standards. Both the originals and standards are presented with a timely urgency. "I Wish I Was a Mole in the Ground," which I've usually heard performed as a jaunty pick-a-thon, becomes a lush, plaintive ballad of unrequited love. "Busted Up Blues" and "The Swinging Judge," the two standouts for me, firmly establish Tough Old Bird's street cred as modern folk singers: embracing tradition, but using the medium to tell new stories. The brothers' layered vocals and seamlessly intertwined guitars remind us of the power of simple, acoustic music. I can only imagine how powerful their live shows are. You can download this EP for however much you want to pay, but I have a feeling you'll want to throw a few bucks these guys' way.